Alliance farming is a fantastic way for Cameroonian cattle herders and crop farmers to work together for mutual benefit. Together with our partner organisation MBOSCUDA, Village Aid has been helping to build these relationships. Alliance farming rotates land use between crop farming and cattle grazing, granting cattle access to nutritious food, enhancing their milk production and improving their health. Meanwhile, the cow manure fertilises the land, thus improving the farmer’s crop yields. In the past 3 months, 22 alliance farming pairs have been formed, giving a total of 62 pairs. One such pair involves Alice Akam, a resident of Acha Village in North West Cameroon. Alice (pictured with her alliance farming partner) has 5 children and relies on farming to support her family. 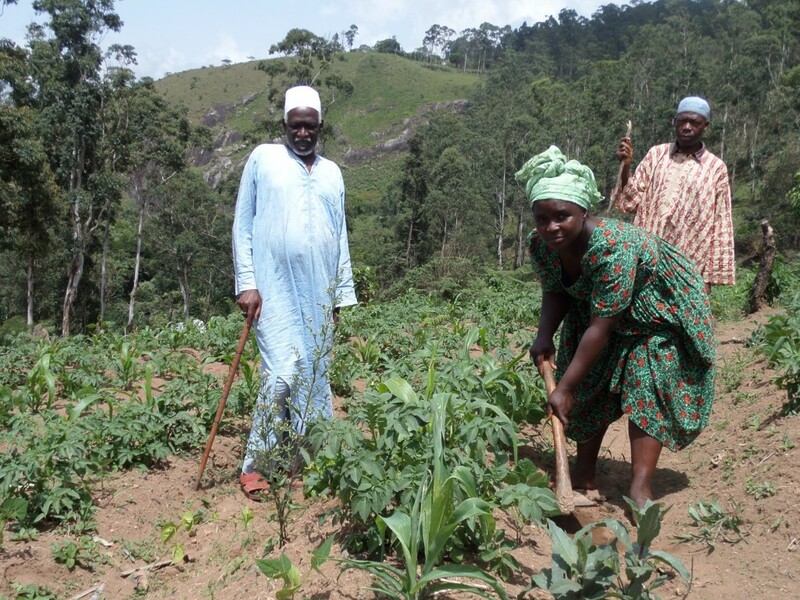 She cultivates various crops including maize, beans and plantain and is a member of the dialogue platform of Acha. These are organised spaces established by MBOSCUDA, which allow farmers and herders to discuss and resolve issues peacefully, before they escalate into conflict. Alice tells us that before the dialogue platforms, conflicts were rampant, killing cattle and destroying crops. In the past, conflicts were presented to the Divisional Officer, a government official overseeing an individual district. Corruption played a big part in resolving conflicts and farmers or herders who bribed officials with cash incentives would most often win. Alice said that this made matters even worse, inciting more conflict and instilling insecurity and resentment in the whole community. Dialogue Platforms have created win-win scenarios for both farmers and grazers, repairing the broken relationships within Akum Village and leading to the formation of more alliance farming partnerships. Alice recalls a recent example of one such repaired relationship. A farmer drove straying cattle away from his farm and was severely beaten by the herdsmen. The matter was reported to the Divisional Officer but amicable settlement was not achieved. After the farmer and herder attended the Dialogue Platform, the two met and discussed their problems and are now great friends, practicing alliance farming together. Alice’s livelihood used to be under constant threat, forever unsure whether her harvest would be successful. Now, Alice has many herder friends who help her out by providing manure. In return, she giving them crops to feed to their cattle. Social ties between farmers and herders have also been strengthened. Alice tells us that the two communities show concern for one another at events such as burials. At a recent herder burial in Baba II Village, crop farmers donated food items to the bereaved family. Farmers and herders are also collaborating on larger community projects including construction of water catchment protection sites, bridges and fences to prevent crop damage by cows.